CD case calendars – one month to view. These come in 3 sizes - mini, standard and landscape. One month to view allows plenty of space for your organisation’s information while still being small enough to sit on someone’s desk. Wall calendars – one month to view. We can produce these in A5, A4 or A3 size. Their size allows for plenty of information and they don’t need to sit on someone’s desk. If required we can distribute calendars either to different organisation or home addresses. 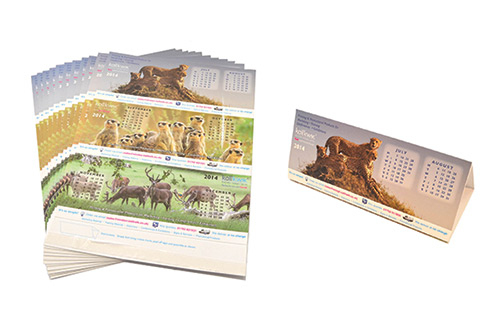 FAST – We would expect to produce a design for most calendars in a couple of days and, depending on quantity, produce your calendars the same or next day. LOCAL – – If it suits you we can visit your office – and at short notice. Free local delivery is part of our service - or you can collect from our centre in Clarence Street. We have a car park for customers’ use behind the centre.